Returns the basic authentication service. An OpenId Connect authentication service provider. This class implements an OpenID Connect client (core specification), which can be used to allow the user to be safely authenticated with your web application without needing to store or even handle his authorization credentials (such as a password). 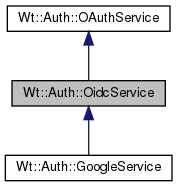 OpenID Connect is a simple identity layer on top of the OAuth 2.0 protocol. It enables Clients to verify the identity of the End-User based on the authentication performed by an Authorization Server, as well as to obtain basic profile information about the End-User in an interoperable and REST-like manner. This implementation only supports authentication using the Authorization Code Flow. The configuration of this service is done by using the setters the service class exposes. Before the authentication process can be started these settings must be configured first and may not be changed afterwards. A "const OidcService" object is thread-safe. The OpenID Connect protocol, including the subsequent use for authentication, consists of a number of consecutive steps, some of which require user interaction, and some which require the use of remote web services. The state machine for this process is implemented in an OidcProcess. To use OpenID Connect, you need to create such a process and listen for state changes. Returns the scope needed for authentication. This returns the scope that is needed (and sufficient) for obtaining identity information, and thus to authenticate the user. Returns the authorization endpoint URL. This is a remote URL which hosts the OpenID Connect authorization user interface. This URL is loaded in the popup window at the start of an authorization process. This is the identification for this web application with the OpenID Connect provider. This is the secret credentials for this web application with the OpenID Connect provider. Returns the method to transfer the client secret. The default implementation returns HttpAuthorizationBasic (the recommended method). Creates a new authentication process. This creates a new authentication process for the indicated scope. Valid names for the scope are service provider dependent. The service needs to be correctly configured before being able to call this function. configure() needs to be called first to check if the configuration is valid. This returns a description useful for e.g. tool tips on a login icon. This is a short identifier. Returns the desired height of the popup window. Returns the desired width for the popup window. Returns the redirection endpoint URL. This is the local URL to which the browser is redirect from the service provider, after the authorization process. You need to configure this URL with the third party authentication service. A static resource will be deployed at this URL. Sets the authorization endpoint URL. Sets the scope needed for authentication. Sets the method to transfer the client secret. Sets the desired height for the popup window. Sets the desired width for the popup window. Sets the redirection endpoint URL. Sets the token endpoint URL. Sets the user info endpoint URL. Returns the token endpoint URL. This is a remote URL which hosts a web-service that generates access and id tokens. Returns the user info endpoint URL. This is a remote URL which hosts a web-service that provides the claims that are associated with the requested scope.